The late Yegor Gaidar, when acting prime minister of Russia, thought up the idea of the Yeltsin Tax. The late Boris Nemtsov didn’t think it was such a bad one when he was first deputy prime minister. The one still surviving officeholder responsible for the idea is Anatoly Chubais, chief executive of the state technology corporation Rusnano; he is unelectable to anything and fortunate to be alive. Their idea was the 100-percent withholding tax which Russians name after President Boris Yeltsin and his reforms. In practice, it was the outcome of deliberate delay in paying wages by state and public institutions, for lack of budget funds from the federal Finance Ministry; and refusal to pay wages by commercial organizations, shareholding corporations, and private companies. According to the Helmer theory of Russian political economy, first propounded in 2002, people who haven’t been paid spend their time blaming the Kremlin for their pain. When arrears rise, the president’s approval rating falls. The first time this happened over a sustained period after Vladimir Putin commenced his first term as president was between May and August of 2000. For every 1% increase in the arrears, month to month, Putin’s rating fell by 0.5%.The sharp fall in the public approval rating for the president in mid-2000 followed by one month an 8% increase in Finance Ministry-ordered wage arrears. 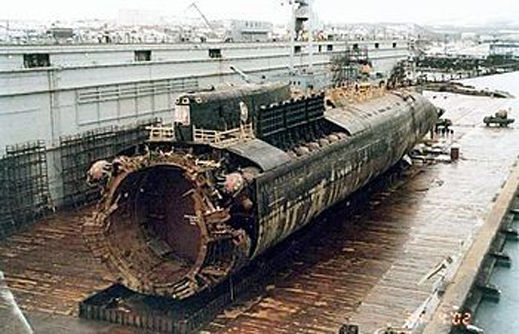 The Kursk submarine disaster compounded the fall in Putin’s rating at the time because it reinforced the public perception that he was powerless to stop catastrophe or remedy ills. The trend up and down in arrears and in political rating continues to hold, even though the magnitude of the Yeltsin arrears has been much greater than the Putin arrears. In 1996, immediately after Yeltsin’s narrow reelection, the countrywide wage arrears total peaked over 103 billion rubles. It fell during 1997, then started up again in 1998, peaking in October of that year, just weeks after the financial crisis, at 88 billion rubles. 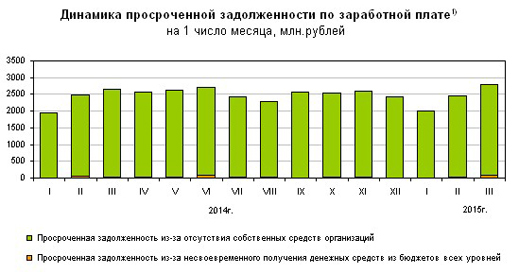 In Putin’s first term, the arrears number peaked in the spring of 2001 at a figure of 34 billion rubles. As the numbers went up earlier that year, the official statistics showed it was commercial or private enterprises rather than public or government bodies that were to blame. By imposing more budget discipline, Putin pulled both the arrears and his rating out of their common dive. For more, read this. This year, since January the official statistics show that as the rate of inflation has risen to almost 17%, real Gross Domestic Product (GDP) has been contracting – at a rate of 2.1% in January, 3.6% in February. The first sign that the government and private employers are passing on the cost of the contraction to wage-earners was in January. Before then it was reported that budget payments had been running on time almost everywhere in the country. In December the trend for corporate arrears was rising in 27 regions, but declining in 42. Total measured arrears that month came to less than Rb2.1 billion. The figure had declined in November and December. The new monthly statistics show that the trend is now reversing, and arrears are growing. By March 1, Rosstat, the state statistical agency, reports the arrears aggregate has jumped 14.7% over the February report and is now Rb2.9 billion. More than half this number, Rb1.98 billion, comes from the state-funded sector, and the failure of these budget organizations to pay on time has almost tripled, compared to January. More regions are now reporting private business arrears than are reporting stable payment schedules. The worst region is Krasnoyarsk, in central Siberia, where the largest private employers are Rusal, the state aluminium monopoly run by Oleg Deripaska, and Norilsk Nickel, controlled by Deripaska and Vladimir Potanin. St. Petersburg is also prominent among the wage-payment laggers. The Crimea leads for payments on time. A breakdown of arrears by industry sector reveals that at the moment manufacturing industries account for most of the problem, followed by construction, transport, agriculture and forestry. The negative trend is a warning of political impact to come, though compared to the Yeltsin tax the magnitude of the current arrears is very much smaller than in the 1990s. For the last report on Putin’s approval rating, as it has climbed in response to the events in Ukraine, European sanctions, and the US war for regime change, read this. Alexei Grazhdankin, an analyst at Levada, confirms there is a correlation between wage arrears and disapproval of Putin’s performance. 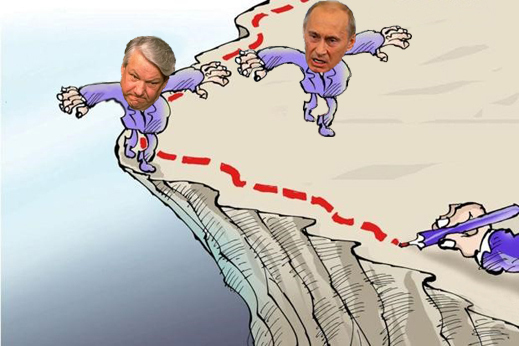 Levada is monitoring the parallel trend as closely as the Kremlin is watching. In January, a Levada Centre survey found there was a 7-percentage point gap for those whose pay has not arrived on time. According to the survey, 18% of respondents reported a delay in wage payments for themselves, their families or friends over the preceding six months; among this group approval for Putin was at 78%. This compared with an overall rating that month of 85%. In the last week of February Levada measured again. Putin’s rating was up a point to 86%; those reporting wage arrears dropped to 9%, and again the magic 7 percentage points – 79% Putin approval rating among those suffering a wage-payment delay. The problem is getting measurably worse, however. 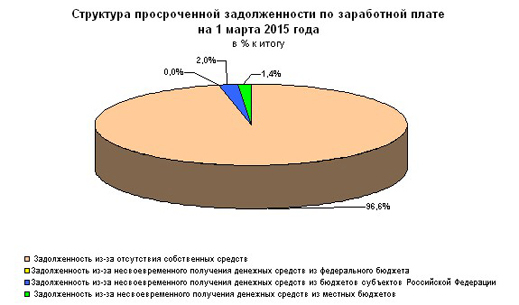 According to Grazhdankin of Levada, asked if they are expecting wage payment delays in the coming weeks, 5% said yes. In that group, Putin’s approval rating has dropped to 63%.